There are some tech-tastic options for your pals that crave the latest and greatest gadgets. Music lovers will swoon over Oakley’s Split THUMP sunglasses featuring a built-in MP3 player and your party animal bestie will shine in Converse Glow-In-The-Dark sunnies by REM Eyewear. 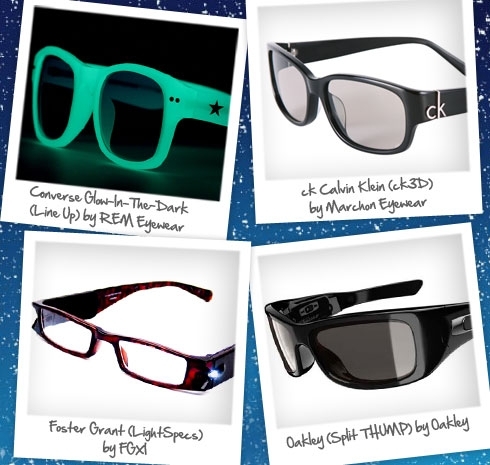 3D frames are a must for movie buffs, so grab ck Calvin Klein 3D shades (these also double as sunglasses) by Marchon Eyewear or scoop up Foster Grant LightSpecs by FGXI (readers complete with a flashlight) for the late-night bookworm in your life. Accessories are a girl’s best friend so get that special someone something fun to tote their glasses in for the New Year. 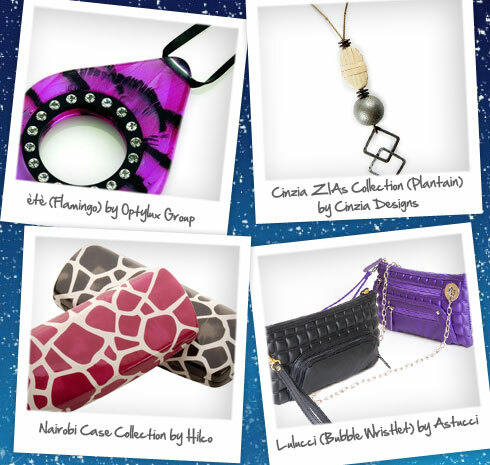 Hilco’s giraffe-print Nairobi cases and Astucci’s Lulucci Bubble Wristlets are fun and flirty. Chains and pendants are also great ways to spruce up an outfit—try this fun, geometric Plantain chain from Cinzia Designs or this feathered été Flamingo pendant by Optylux Group. Surprise your favorite tree hugger with eco-friendly frames. 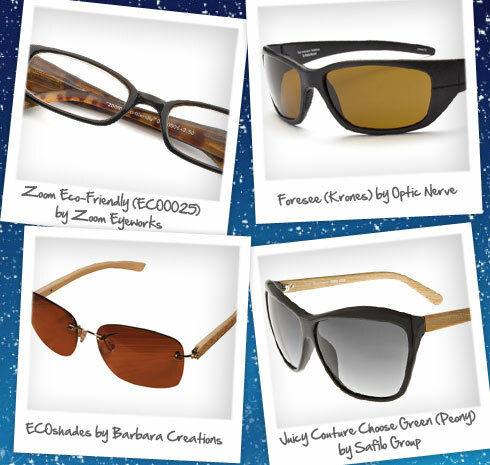 Explore options like Juicy Couture’s Choose Green collection by Safilo Group, featuring “green plastic” and bamboo; or rimless Barbara Creations ECOshades made from bamboo and “green metal.” Optic Nerve’s Forsee shades are made without petroleum-based products and Zoom Eco-Friendly readers by Zoom Eyeworks are made from reclaimed plastic. 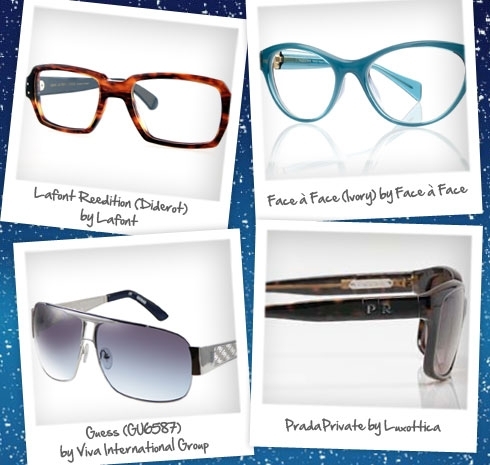 If your man is in need of new specs or shades, you can’t go wrong with these geek chic Lafont specs or these sleek and trendy Guess aviators by Viva International Group. Thrill your lady by surprising her with Prada’s new line of customizable sunglasses, PrivatePrada by Luxottica. Or if she prefers the retro look, make her day with this smoldering Face a Face cat-eye. While they might not like to admit it, your parents might not be able to read the newspaper like they used to. Show them that reading the fine print doesn’t have to be so hard with these svelte, semi-rimless Magnivision readers by FGXI or dazzling, jewel-encrusted Personal Optics frames by StyleMark. 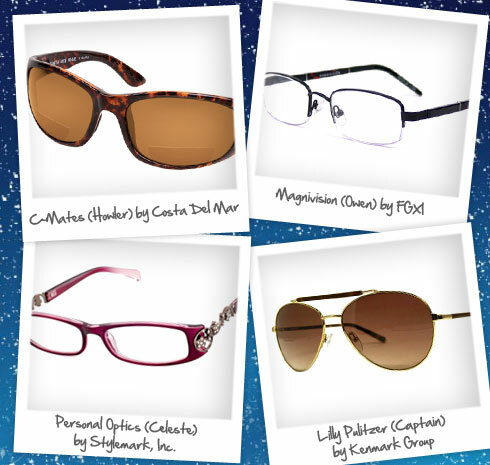 Lilly Pulitzer’s sun readers by Kenmark Group or Costa Del Mar’s C-Mates are perfect for those who like to read a few chapters while basking in the sun. The athletically inclined are always looking for the perfect sunglasses to fit their action packed life. 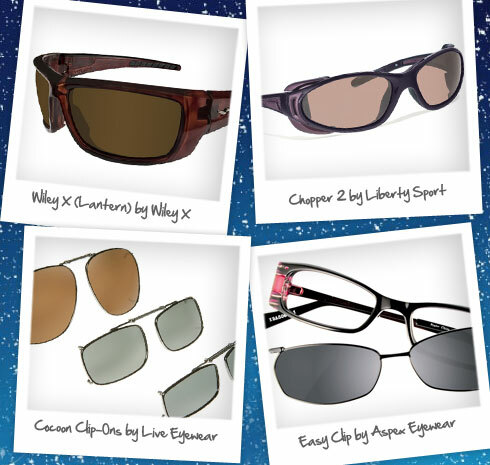 Great picks include Liberty Sport’s Chopper 2 which utilizes removable MagTraxion eyecup technology and Wiley X’s Active Series Lantern frames that feature rubberized temples and nose piece, so they won’t slip off. For hikers and explorers, choose Cocoon Clip-Ons by Live Eyewear or Easy Clip lenses by Aspex Eyewear which snap right onto optical frames.